Irvine, CA — Traditionally, facial plastic surgery treatments and procedures were thought to be far more popular among women than men. Although females still edge males statistically, times have changed and many more men are deciding to undergo cosmetic facial procedures. Orange County facial plastic surgeon Dr. Ali Sepehr says he has experienced the same trend at his practice and is happy men are beginning to view facial cosmetic enhancement as a gender neutral option. He adds that among the range of facial enhancement treatments he offers, certain procedures seem to be more popular with men than others. Dr. Sepehr says the most popular procedure among males at his Orange County facial plastic surgery practice is rhinoplasty. Because the nose is the central focal point of one’s face, he says patients can experience feelings of self-consciousness if their nose is disproportionate or crooked. In order to alleviate these concerns, Dr. Sepehr utilizes the most advanced rhinoplasty techniques to increase, reduce, or reshape the size of the nose. Apart from its aesthetic benefits, he adds that the procedure can also be a great option for men wishing to improve nasal function by opening up airways to allow more airflow and easier breathing. The procedure can vary depending upon the extent of surgery needed to address each individual’s goals. Because of the complexity of this procedure, Dr. Sepehr begins with a one-on-one consultation to develop a personalized procedural plan from pre-op concerns to recovery. Following the consultation, he performs the rhinoplasty operation which generally consists of bone and cartilage reshaping, as well as skin adjustment by means of multiple, hidden incisions. Most patients are able to return home the day of the procedure, but Dr. Sepehr says patients should make arrangements for a ride home and help around the house during the first couple of days following the procedure. In an effort to reduce recovery time and lessen bleeding, bruising, and swelling, he adds that he uses dissolvable sutures to stabilize results instead of the traditional “packing” method. Recovery times can also vary, but Dr. Sepehr says patients can typically expect to return to their normal routines after 14 days. He says the procedure is a great option for men concerned about noticeable bruising and swelling because virtually all signs of surgery will often diminish over the course of a few weeks. Additionally, Dr. Sepehr believes that any male undecided about receiving facial plastic surgery should consult with an experienced surgeon to obtain comprehensive procedural information and discuss any concerns they may have. 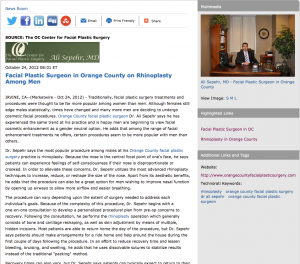 Dr. Ali Sepehr is the founder of The OC Center for Facial Plastic Surgery and is dedicated to providing Orange County, CA with the latest, most advanced techniques and procedures in facial plastic surgery. His practice offers a variety of treatments ranging from rhinoplasty and facelift, to facial implants and laser skin resurfacing. Dr. Sepehr earned his medical degree from the University of California, Los Angeles School of Medicine and has been an avid proponent of continued education, and has given multiple medical presentations and lectures. He is a specialist in facial plastic surgery and a member of many medical organizations including the Head and Neck Optical Diagnostics Society, among others. Dr. Sepehr’s practice is located at 16300 Sand Canyon Ave Suite 201 Irvine, California 92618, and can be reached via phone at 949-371-6963. He and his staff can also be contacted online at orangecountyfacialplasticsurgery.com or The OC Center for Facial Plastic Surgery Facebook page.